1Vreden Russian Research Institute of Traumatology and Orthopedics, St. Petersburg, Russia. 2Saint-Petersburg State University, St. Petersburg, Russia. In order to determine or exclude the presence of deformation of the long bone, reference lines and angles (RLU) are used. RLS includes anatomical, mechanical axis of bones, joint lines, as well as anatomical and mechanical angles in the frontal and sagittal planes [1-9]. Anatomy of the femur in the sagittal plane is of great clinical importance. It affects the position of the point of introduction of the intramedullary stem, the design of the femoral components of the revision hip joint endoprostheses. It is known that the diaphysis of the femur has a physiological bend in the sagittal plane [10-12]. As a result, the anatomical axis of the femur in the sagittal plane looks like a curved line. In the works devoted to the treatment of deformities of the femur, both for planning the correction of deformities in the sagittal plane and for evaluating the anatomical results of treatment, the authors use only the distal anatomical angle of the femur [6,13,14]. However, the use of only anatomical articular angles in the sagittal plane allows one to evaluate the physiological flexure of the femur not throughout the entire diaphysis, but only in the proximal and distal parts of the femur. 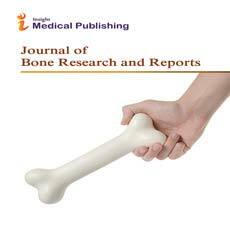 In addition, the study conducted by Tang found that the distal third of the femur has a significantly greater curvature than the proximal and middle third of it. Thus, it can be stated that in the world literature there is no information allowing correctly to plan and control correction of deformation in the sagittal plane during the diaphyseal section of the femur. Thus, the aim of the work was to determine the reference lines and angles of the femur in the sagittal plane, describing its physiological curvature. To achieve the goal, we studied 30 femurs of adults of both sexes aged 21-56 years. Only those radiographs where the RLA corresponded to the normal values described in the literature [5-7] were used for the study. The study was carried out as follows. Photos of the entire femur X-rays in the strictly sagittal plane were taken from the same distance by one digital camera fixed in a tripod. Then the photos were processed in the Adobe Photoshop CS3 graphics editor. In the program, a femoral skiagram was created, median diaphysis lines (anatomical axes) were made separately for the proximal, middle and distal third of the diaphysis (Figure 1). The values of the angles formed at the intersection of the axes of the fragments were measured using the program's capabilities. 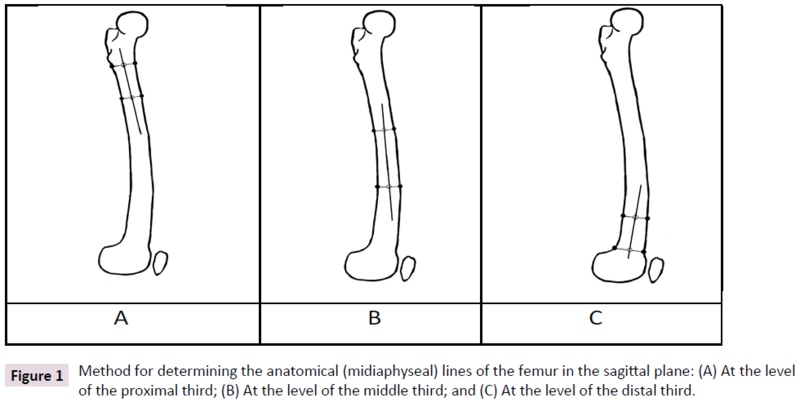 Figure 1: Method for determining the anatomical (midiaphyseal) lines of the femur in the sagittal plane: (A) At the level of the proximal third; (B) At the level of the middle third; and (C) At the level of the distal third. The results were processed using the statistical for Windows software (version 9.0). All the main indicators of descriptive statistics were determined-the mean value of the indicators, the minimum and maximum values, and the standard deviation. The obtained reference values are shown in Table 1 and Figure 2. The average value of the angle formed at the intersection of segments of the anatomical axis at the level of the proximal third of the femoral diaphysis was 10°. The angle formed by the intersection of segments of the anatomical axis at the level of the proximal and distal third is 16°. The angle between the parts of the anatomical axis at the level of the middle and distal third is 7°. Table 1: The angles of the intersection of parts of the anatomical axis Femur in the sagittal plane (degrees). Figure 2: Reference values of the physiological curvature of the femur in the sagittal plane: (a) The angle of curvature of the femur in the sagittal plane at the level of the proximal third; (B) The angle of curvature of the femur in the sagittal plane at the level of the middle thirds; and (C) The angle of curvature of the femur in the sagittal plane at the level of the distal third. An example of using the found reference values is shown in Figure 3. 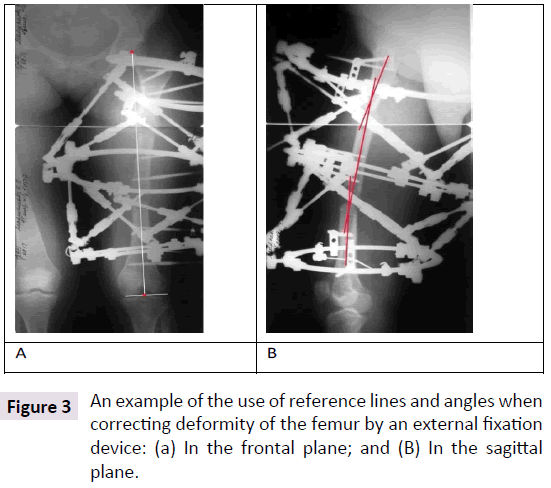 Figure 3: An example of the use of reference lines and angles when correcting deformity of the femur by an external fixation device: (a) In the frontal plane; and (B) In the sagittal plane. Thus, the obtained data should be used to correct deformation of the femur in the sagittal plane, namely, in order to avoid the "straightening" of its physiological curvature. 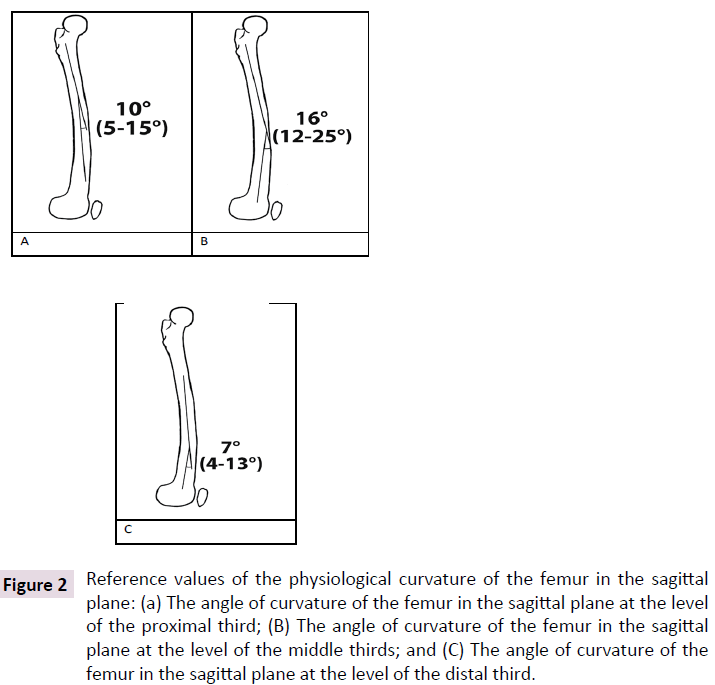 Reference values of the physiological curvature of the femur in the sagittal plane: A) The angle of curvature of the femur in the sagittal plane at the level of the proximal third; B) The angle of curvature of the femur in the sagittal plane at the level of the middle thirds; C-the angle of curvature of the femur in the sagittal plane at the level of the distal third (Figure 2). The relative small number of bones examined allows us to consider the results of the study as preliminary. Solomin LN (2005) Fundamentals of transosseous osteosynthesis apparatus GA. Morsar AV 24: 540-544. Chao EY (1994) Biomechanics of malalignment. Orthop Clin North Am 25: 379-386. Krackow KA (1983) Approaches to planning lower extremity alignment for total knee arthroplasty and osteotomy about the knee. Adv Orthop Surg 7: 69-88. Moreland JR (1987) Radiographic analysis of the axial alignment of the lower extremity. J Bone Joint Surg 69: 745-749. Paley D, Herzenberg JE, Tetsworth K, McKie J, Bhave A (1994) Deformity planning for frontal and sagittal plane corrective osteotomies. Orthop Clin North Am 25: 425-465. Solomin LN (2012) The basic principles of external skeletal fixation using the Ilizarov and other devices. Orthopaedics 13: 1590-1593. Solomon L (2010) Apley's System of Orthopaedics and Fractures. Hodder Arnold 1: 970-974. Yoshioka Y (1987) The anatomy and functional axes of the femur. J Bone Joint Surg Am 69: 873-880. Gilbert BM (1976) Anterior femoral curvature: its probable basis and utility as a criterion of racial assessment. Am J Phys Anthropol 45: 601-604. Harper MC (1987) Curvature of the femur and the proximal entry point for an intramedullary rod. Clin Orthop Relat Res 220: 155-161. Tang WM (2005) Sagittal bowing of the distal femur in Chinese patients who require total knee arthroplasty. J Orthop Res 23: 41-45. Manner HM (2007) Accuracy of complex lower-limb deformity correction with external fixation: a comparison of the Taylor spatial frame with the Ilizarov ring fixator. J Child Orthop 1: 55-61. Marangoz S (2008) Femoral deformity correction in children and young adults using Taylor spatial frame. Clin Orthop Relat Res 466: 3018-3024.